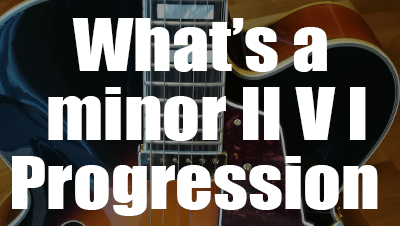 This progression is based on the C harmonic minor scale. We are now going to build chords from this scale. Now it's time to take the three basic chords constructed on each degree of the C harmonic minor scale. The chord corresponding to the first degree is a minor major seventh chord (CmM7) , the chord corresponding to the second degree is a minor seventh flat five chord (Dm7b5) and the chord corresponding to the fifth degree is a dominant seventh chord (G7). These chords are grouped together so, they form the minor II-V-I progression. You can embellish the dominant 7th chord by adding notes from the scale (b9,#9, 11, b13). Let's take a look at the three basic modes generated from tones of the C harmonic minor scale. The first is the C harmonic minor scale. It will be used to play over the minor (major seventh chord (I) (CmM7). The scale starting on the second degree of the C harmonic minor scale is called D locrian 13 mode. It will used to play over the minor seventh flat five chord (II) (Dm7b5). The scale starting on the fifth step is called G phrygian dominant. It will be played over the dominant (V) chord (G7). Theoretically, you could play just the harmonic minor scale over the whole minor II-V-I sequence because all notes in the scale relate to the chords constructed from it. At the long run it will be boring to play only notes from the harmonic minor scale so here are some possible ideas to spice up your improvisations and embellish your lines. What Scale To Use Over Dm7b5? The Locrian mode is the seventh mode of the major scale. This is the basic mode to play over a m7b5 (half-diminished) chord. An half-diminished arpeggio consists in playing the first, minor third, flat fifth and minor seventh of the Locrian scale. Logically, we should play a b9 over Dm7b5 but to brings new colors to our musical language we can add the 9 instead of b9. In this way we leave the tonal context for a modal approach. By adding the ninth to the Locrian mode, we get the locrian # 2 mode. This is the sixth mode of the melodic minor scale. The locrian bebop scale is the same as the Locrian mode including a passing tone (5). There is eight notes in it (octatonic scale). What Scales To Use Over G7? As we have seen previously the basic scale to play over a dominant 7th chord in minor harmonic key is the Phrygian dominant mode. By taking the first, the third, the fifth and the minor seventh we obtain a dominant 7th arpeggio. Playing this scale and arpeggio is a little too ordinary and not very interesting. In this case we usually play a diminished seventh arpeggio starting on the major third (3) of the chord. Here is a comparison between the G Phrygian mode and the Bdim7 arpeggio. Playing a diminished seventh arpeggio over a dominant seventh chord brings the b9. This technique also called "3 to b9" is widely used by Wes Montgomery, Grant Green and many jazz players. To enlarge your musical vocabulary it is possible to think G7 as an altered chord, therefore using notes of the altered scale over it. The "Altered scale" (also called "super Locrian mode") is the seventh mode of the melodic minor scale. Playing the altered scale over a dominant 7th chord brings tensions and more sophisticated sound. The combination of the locrian # 2 mode and the altered scale works well over II-V sequences. What Scale To Use Over cm(Maj7)? Feel free to resolve to CmM7, this chord is not necessarily used after a minor II-V sequence. However, we will think about what we're going to play. The most obvious solution is to play the harmonic minor scale, melodic minor scale, Aeolian mode or their corresponding arpeggios. You can also add extensions (9, 11,13) to these arpeggios. The harmonic minor scale contains seven notes, these are the same as the natural minor scale (Aeolian mode) except the seventh degree that is raised by one semitone. D Locrian over Dm7b5 chord and altered scale over G7alt, ending on the fifth of Cm(Maj7). 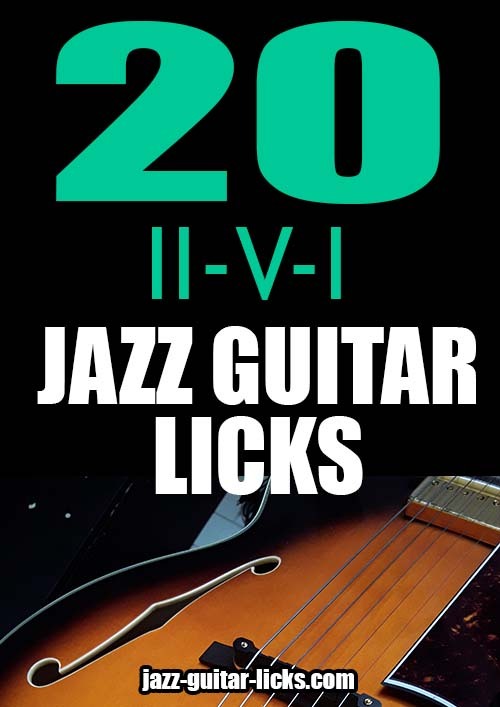 10 minor II-V-I jazz guitar licks. PDF eBook with tabs, analysis and scales charts. Jazz guitar lessons online.